Despite it's name the Sumatran Rhinoceros is geographically not limited to Sumatra alone. Originally the species was living in the wide stretch from Bhutan (western slopes of the Himalayas) via India, Bangladesh, Burma/Myanmar, the Malay Peninsula as south Thailand and peninsular Malaysia, Sumatra and Borneo. 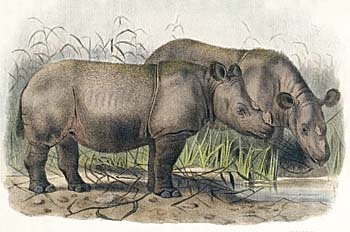 A painting of two Sumatran Rhinos in the zoo of London, 1872. One of them, a female, was named 'Begum' and caught in Bangladesh in 1868. It was living in the London zoo from 1872 to 1900, when it died. Image source: en.wikipedia.org, common free. 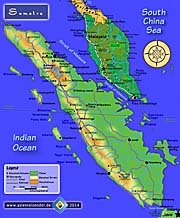 Tenthousand and more years ago there was a landconnection between the Malay Peninsula and the great Sunda Islands like Sumatra, Java and Borneo (see also: Wallacea). The rhino's natural habitat is the tropical rainforest, but it moves also up in the mountains to an altitude of up to 2,000m; particularly in rainy season the rhinos retreat to higher elevations. There are five different kinds of rhinos living on earth nowadays; the Sumatran Rhinoceros is the smallest of them. It has two horns and a brown/reddhish colour. It's the only rhino with some hair on it's body. The Sumatran Rhinoceros is itself divided into three subspecies with only slight differences. The Sumatran Rhinoceros is a critically endangered species with merely 200 to 300 individuals left in freedom. Most of them live in Sumatra (Gunung Leuser National Park, estimated 60 - 80 individuals, Bukit Barisan Selatan Nationalpark, south Sumatra, estimated 50 - 70 indivuduals), some more on the Malay Peninsula (e.g. in the Malaysian national park Taman Negara, estimated 20 - 35 indivuduals; they are predicted to extinct in the coming years). A few more live in the Malaysian part of Borneo, in the province of Sabah. In the 1980s there was a population of estimated 500 individuals in Kerinci Seblat National Park in Sumatra - this population is now extinct mostly due to poaching. A single kilogramm of rhino horn brings around 30,000 $US on the black market - that's a death verdict in a world where everything is about money. However, all the folks believe in magic traits of rhino parts and also the promises of Chinese medicine as a relief for many diseases is just superstition - nothing of it is true. The rhinos die for no reason. A remarkable trait of the Sumatran Rhino is it's sophisticated communication. They use a variation of sounds for exchanging information, and they 'like to talk', so to say, means they make frequently use of their communicative abilities. The hearing and the smelling abilities of the rhinos are very sensitive, while their sight is rather limited. Nevertheless, the Sumatran Rhinoceros is a solitair. Usually bulls and cows live separated in certain territories. The territories of the bulls are much larger (50km2) than those of the cows (15km2). They meet to couple and separate again after. Usually they are most active in the times between dusk and dawn. In the center of the rhinos territories are usually water ponds in whose they like to bath, like the water buffaloes do as well. At the bank of the ponds the animals create a clearance in the vegetation for resting there. 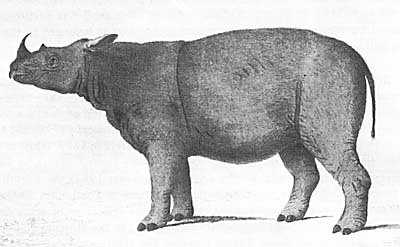 The first scientific drawing and description of a Sumatran Rhinoceros was made by William Bell in 1793, an English who saw the shot animal in Bengkulu, west Sumatra (what was an English colony at the time). He send both to the Royal Society of London. 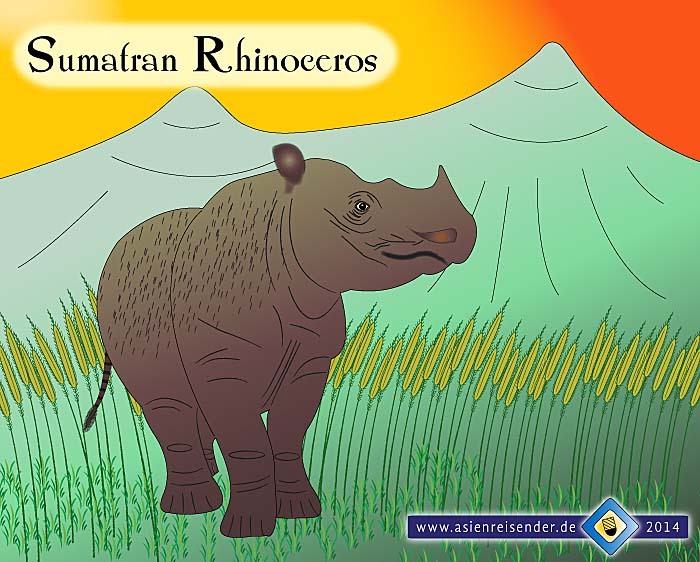 The Sumatran Rhinoceros is not very reproductive. Cows are pubescent from the age of seven years on, bulls after ten years of age. A pregnancy takes 15 to 16 months. Rhinoceros cows give birth to single calfs. Between two pregnancies lies a time of four or five years. A calf is living for two to three years with it's mother, than they separate. The lifespan of a rhino in the wild is about 30 to 45 years. The size of the Sumatran Rhinoceros measures a height of about 120cm to 140cm (shoulders), a length of 250cm to 320cm (a 60cm long tail comes extra) and they weight between 500kg and 800kg. The skin is between 1cm and 1.6cm thick. The rhino feeds exclusively from plants, that is bamboo, leaves, bark, fruits etc. It's having around 60kg food per day, what is about 10% of it's weight. The heavy rhinoceroses can, despite their weight, move very quickly in the jungle. They are also good in climbing slopes. Bushes and smaller trees are no obstacle for the strong and compact animals. They are also strong swimmers and can cross rivers with considerable currents. Adult rhinos have no natural enemies except man, small ones can be threatened by tigers or feral dogs. Nevertheless they fall often victim to parasites as ticks and worms. Horse flies are a vector for letal infections. The heaviest threat for the Sumatran Rhinoceros comes from poaching. As already mentioned above, the rhino's horn is in the Chinese mythology a powerful medicine. There is a black market for such animal products, where poachers or secondary dealers can reach high prices for their prey. Another threat is the rapid destruction of the natural habitates as the tropical rainforests. Natural desasters or contageous diseases do their part to the further decimation of the rare animals.